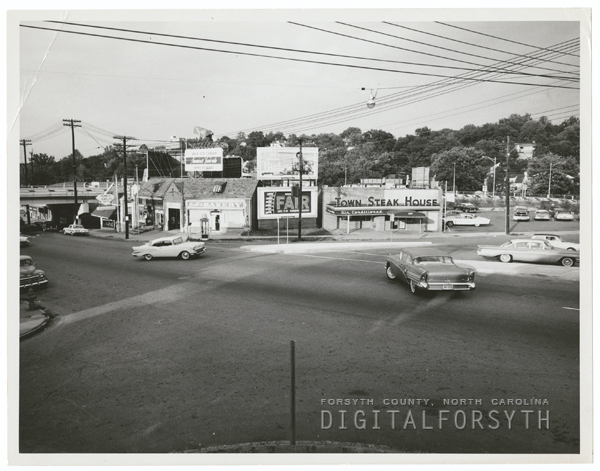 Digital Forsyth | Hawthorne Road at Lockland Avenue, 1962. Home › Photos › Hawthorne Road at Lockland Avenue, 1962. Hawthorne Road at Lockland Avenue, 1962. Hawthorne Road at Lockland Avenue, 1962. The photograph shows the Town Steak House and Hall’s Bakery, plus Interstate 40. Hawthorne Road at Lockland Avenue, 1962. The photograph shows the Town Steak House and Hall's Bakery, plus Interstate 40. These images are protected by copyright restrictions. Please contact the owning library (Forsyth County Public Library) for more information.